In recent months the US equity markets have become increasingly sensitive to movements in treasury yields. BMO Capital Markets: - U.S. equity markets stumbled this week, with the S&P 500 sliding 2.1% and the Dow now skidding almost 4% from the record close set earlier this month. Most of the damage came on Thursday alongside a host of factors including disappointing July industrial production, downbeat corporate news from some Dow heavies and, perversely, a drop in jobless claims to the lowest level since 2007. The latter helped stoke expectations that Fed tapering is fast approaching, and pushed the 10-year Treasury yield above 2.8% for the first time in more than two years. Indeed, while not a big fan of the whole ‘good news is bad news’ refrain, it’s hard to ignore the recent inability of the equity market to absorb upward moves in bond yields. In fact the correlation between the S&P500 and the 10yr treasury yield hit a new post-recession low (higher yields driving stock prices lower). Not surprisingly, it was the high-dividend shares that have been most impacted by rising rates (higher rates decrease the present value of future dividends). 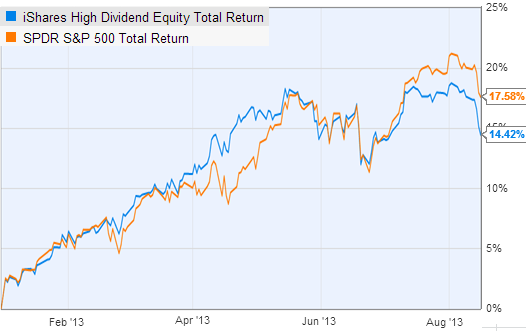 After an impressive performance this spring, high dividend shares now lag the S&P500 by over 3% for the year (on average). Furthermore, if rates continue to rise, higher cost of borrowing will ultimately begin to eat into earnings - and will be immediately reflected in stock prices. At this stage the stock market in the US (and to some extent globally) is taking its lead from treasuries.